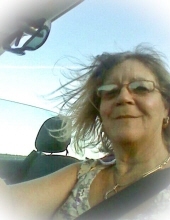 Phyllis Goggin Carroad, 60, of Rutland, Vermont passed away in Pine Bush, New York on November 22, 2018 after a year-and-a-half-long battle with Lymphoma. Born on January 9th, 1958 in Newburgh, NY to Walter F. Goggin Sr. and Phyllis (Perrego) Goggin, Phyllis graduated from Wallkill High School as part of the class of 1976. She was a caring, loving and spunky spirit with a love for cooking, knitting, and traveling; especially driving, as she drove cross-country multiple times. She had a career with J. Kokolakis Contracting that she adored and was pleased to see the new finished gym and library at West Point that they constructed. Most of all, she adored her family. They were always her priority and her true love were her grandchildren. She is survived by her partner William Gray of Rutland, VT; Two sons, Richard Salvaty of Las Vegas, Nevada and his life partner, Bobbijo Stewart; Michael Salvaty of Saint Albans, Vermont and his wife, Chelsea Salvaty. Two daughters, Eva Heath Of Glens Falls, New York and her partner, Angelo Shorey; Barbara Flowers-Truax of Campbell Hall, New York and her husband, Ronnie Truax; 15 grandchildren and 1 great grandchild; Her mother, Phyllis Goggin (Perrego) of Burlington, Vermont; 3 Brothers, Walter Goggin Jr. of Franklin TN and his wife, Colleen; Ricky Goggin of Pine Bush, NY and David Goggin of Maryland; 3 Sisters, Linda Egan of Denver, NC and her husband, Mike; Tina Goggin of San Bernardino, CA and her husband, Ron Hamilton; and Wendy Goggin of Dallas, TX; and numerous Aunts, Uncles, Cousins, Nieces, and Nephews. She is predeceased by her son, Anthony Philip Salvaty; father Walter F. Goggin Sr; sister-in-law Barbara Goggin (Teroni); Aunt Carma Ryan (Perrego) and life-long best friend Mattia “Mary” Scifo. Relatives and close friends are invited to attend A Celebration of Life for Phyllis Saturday December 1st from 2-5pm held at the DAV New Windsor 30 Lawrence Ave. New Windsor, NY. Food will be provided. If you’d like to donate or send money, we’d ask that you send those donations to The American Cancer Society in Phyllis’s name. To send flowers or a remembrance gift to the family of Phyllis Goggin-Carroad, please visit our Tribute Store. "Email Address" would like to share the life celebration of Phyllis Goggin-Carroad. Click on the "link" to go to share a favorite memory or leave a condolence message for the family.